For many years most regulatory standards called for the use of a half-wave dipole antenna set for frequencies above 20 MHz. However, to reduce test time, broadband antennas such as the biconical antennas began to be accepted. Broadband antennas, compared to half wave dipoles, reduce test time because the technician does not have to stop the test to adjust the dipole element length for each frequency of interest. The biconical antenna is considered a standard workhorse for every compliance test lab. Used in a variety of applications such as radiated emissions, immunity and shielding effectiveness testing; this antenna has proven to be a valuable asset. Biconical antennas are also used for Normalized Site Attenuation (NSA) measurements, site evaluation (CISPR 16-1-4 SVSWR procedure) and spectrum monitoring applications. 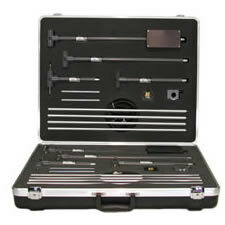 In recent years the development of higher frequency biconical antennas have expanded their capabilities and usefulness. 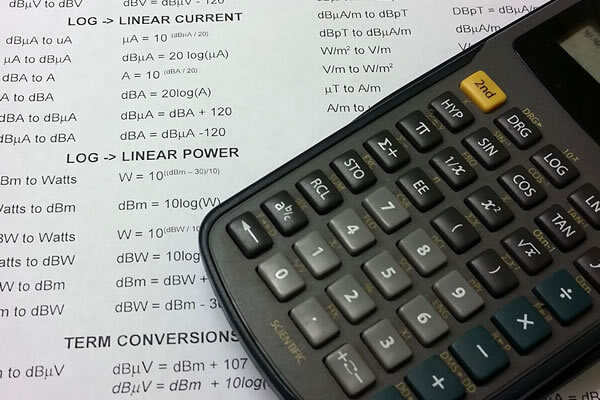 This application guide will explain the typical antenna properties, specifications and applications of biconical antennas. 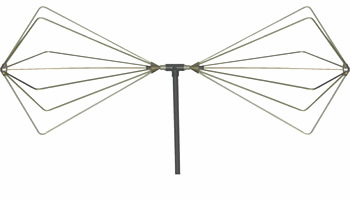 Biconical antennas have several unique antenna characteristics that separate them from other antenna types. These linear polarized antennas are typically used in the frequency range of 20 MHz to 300 MHz for compliance testing; and we have several models covering this frequency range and some models covering up to 18 GHz. 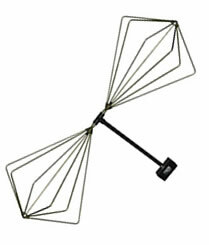 Biconical antennas are similar to dipole antennas except that they have conical shaped elements. They also have an integrated balun (balanced to unbalance) structure that impedance matches the elements to the transmission line. Some baluns are made for high power capability suitable for immunity testing. 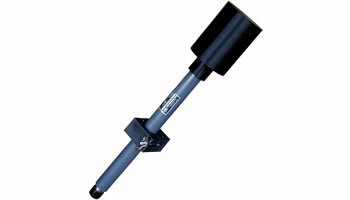 In most cases these lightweight antennas have removable elements for easy storage. Our folding biconical antenna has elements that can also be closed similar to an umbrella allowing the antenna to be contained in a compact transit case. The antenna bandwidth is the total frequency range that the antenna can operate. These types of antennas exhibit a broad frequency range starting from 20 MHz covering up to 18 GHz. One of the advantages of the biconical antenna is the broad frequency bandwidth coverage with it's compact size. The antenna VSWR is a ratio of the reflected power due to the mismatch between the antenna and the measurement system. One draw back to the biconical antenna design is the poor VSWR especially below 80 MHz. This is typically due to the limited size requirements spelled out in MIL-STD 462 and can be overcome by the selection of a larger element set. Another way to overcome this short fall is to add a 3 or 6 dB attenuator. This will improve the VSWR in the order of 2:1 or even better. The radiation pattern is a chart of the variation of the field intensity of an antenna as an angular function with respect to the axis. The radiation pattern of the biconical antennas are similar to the half-wave dipoles. They have an omni-directional response in the H-plane, and a figure eight shape in the E-plane. 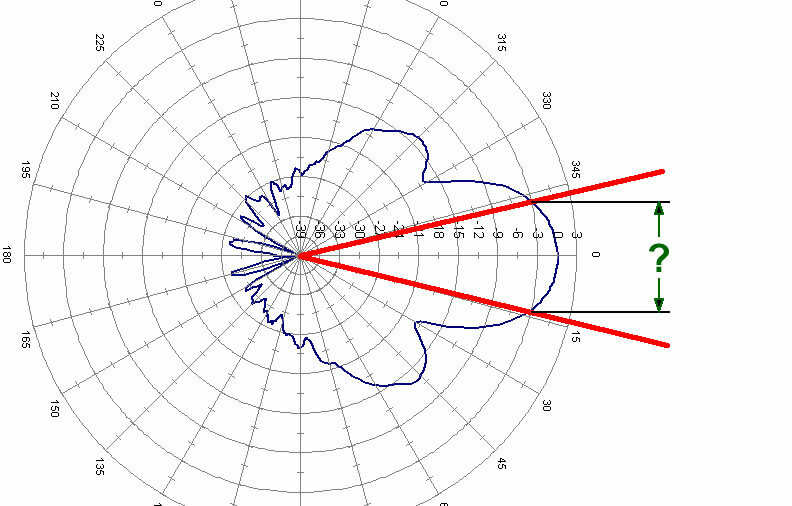 The H-plane beamwidth pattern makes these antennas ideal for field survey and spectrum monitoring. The biconical antennas are used in a variety of testing applications. It's shape, power capabilities and frequency range makes this antenna ideal for both emissions and immunity testing for MIL-STD, FCC, CISPR and other test specifications. Radiated emissions testing is the most common test type performed for compliance testing. It requires measuring the field strength of the Equipment Under Test (EUT) generally in the 30 MHz to 1 GHz range. 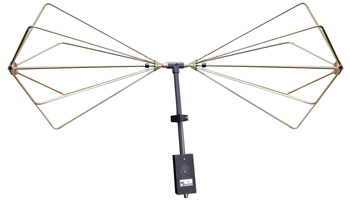 For the lower portion (30 MHz to 300 MHz) the SAS-540 rigid biconical antenna is recommended as it has a smoother response due to it's unique balun design. 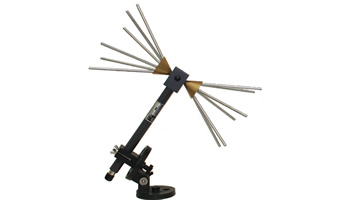 The SAS-542 folding biconical antenna is also an excellent choice especially for portable applications. Radiated immunity testing requires the EUT to operate adequately when illuminated with high fields of electromagnetic energy. Typically performed from 80 MHz to 1 GHz, the SAS-543 high power biconical antenna is capable of generating those high fields at the lower 20 MHz to 300 MHz range and can produce 100 V/m from 80MHz to 300MHz. The use of larger elements and/or element extensions can be used to produce even higher fields. Shielded enclosures are Faraday cages, or metal structures connected to a ground that prevent RF energy from entering the enclosure and from leaking out. The shielding effectiveness of these enclosures require the use of biconical antennas. The SAS-544 high field biconical antenna has a coaxial wound balun and is the optimal solution for this type of testing. It can handle enough power to test the shielding effectively. A test site is a measurement device and should be periodically re-certified for it's effectiveness. The validation of test sites often requires the use of biconical antennas per ANSI C63.4. The SAS-540 rigid biconical antenna is the recommended biconical antenna to satisfy the normalized site attenuation measurement requirements up to 300 MHz and evaluations above 1 GHz also requires the use of a biconical antenna like the SAS-547 for the CISPR 16-1-4 SVSWR procedure. Regular performance evaluation of EMC test sites is recommended. Spectrum monitoring or radio surveillance covers a broad operating range. The biconical antenna is ideal for this type of application because of it's wide operating range and omni-directional pattern. There are several benefits in selecting a biconical antenna for your testing application. One of the greatest benefits is the compact size. A comparable dipole antenna operating in the same frequency range would be 16' wide compared to a mere 3' wide biconical antenna. Another benefit is the broad frequency coverage. Whether performing a standard compliance test or simply using it for field monitoring, these antennas display efficient performance characteristics. Below is a comparison of the different versions of biconical antennas that we offer and some of their unique features. 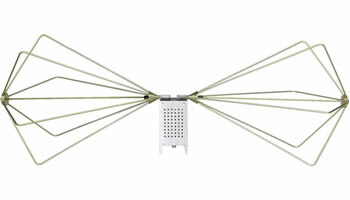 This Biconical Antenna is an ideal solution for high frequency, broadband, omni-direction requirements.